Earnings season continues. According to FactSet, analyst expectations are for another decline (approximately -5% )in second quarter earnings, but forward earnings expectations are firming up. The Fed meets this week — no rate change expected. The rally of the last several sessions is being helped by a firming of earnings forecasts. Just how much improvement in earnings is expected, and what will the market be willing to pay for those earnings? According to FactSet, analysts increased their forward 12-month S&P 500 operating earnings number to $127 in June from $124 back in February. Viewed in a longer-term perspective, we see that the run to $127 of earnings closely tracked the U.S. economy’s overall growth from 1978 (Chart A below). 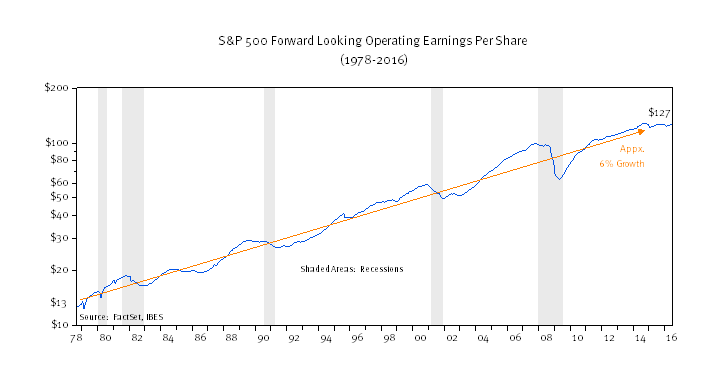 Earnings and the economy (GDP) both expanded at nearly the same 6% annualized pace over the 1978-2016 period. Since earnings are the primary driver of stock prices, and the economy is the primary driver of corporate earnings, we can simply say that the economy is the single most important driver for long-run stock returns. Of course, there were setbacks along the way. Recessions did occur and earnings temporarily fell in each and every instance, before rebounding to even higher levels. The amount investors were willing to pay for a dollar of earnings (“the earnings multiple”) also fluctuated over time. However, the important story remains the tremendous growth in S&P 500 index earnings over the past 38 years. What the market pays for a dollar of earnings at different points along the way is a different question. 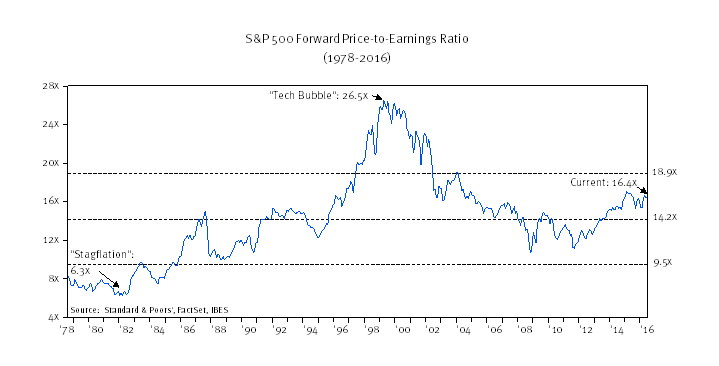 Earnings “multiples” (the index price divided by the earnings) ranged from a low of 6.3x in the early 1980s to 26.5x in the 1990s tech bubble (Chart B, below). The average multiple was 14.2x, and 9.5x to 18.9x can be thought of as a “normal range” for multiples over the period. Currently, we stand at 16.4x earnings — 15% above average. By this measure, the market is pricey but not extraordinarily so. But what effect do multiples have on performance? Although past performance is not a guarantee of future results, we decided to compare multiples with the market’s return over the ensuing five years (Chart C, below). Because the S&P 500 total return index begins in 1988, we use 1988 as our starting year in making this graph. The downward sloping line in the chart below demonstrates that when multiples in the past were high (moving to the right along the horizontal bottom axis), the realized annual return over the next five years (the vertical left axis) tended to be lower. 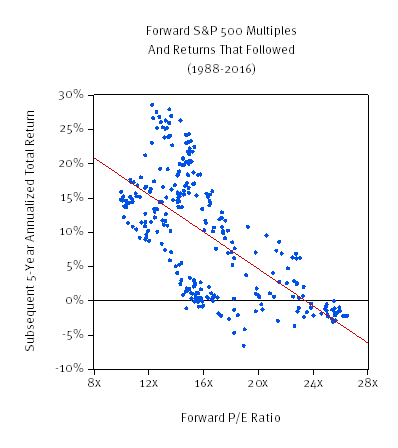 When multiples were above 20x, the forward return tended to be low or negative. When multiples were in the low teens, returns that followed tended to be better. What is clear in the chart above is the simple fact that valuations matter. However, multiples are not the most important long-run drivers for returns. That honor still goes to the economy. This is why the economy is the center of so much investor attention. Still, valuations are important and we pay close attention to these as well. At 16.4x earnings, we envision some reversion toward a mean multiple over time. This will likely impart a small penalty to long-run returns, but this penalty is offset by growth and a cash return in the form of dividends and net buybacks. We are also reminded that, at 1.6%, 10-year U.S. Treasury bonds don’t offer much in the way of a competitive return. LONG-RUN STRATEGIC POSTURE: Our long-run forecasts lead us to overweight large cap domestic growth stocks, high-yield corporate bonds, and gold in the diversified “core” of portfolios. Underweight positions in “core” are long-term U.S. Treasuries, foreign developed equities, and REITs. Meanwhile the equity allocation in the short-term tactical “satellite” portion of portfolios was increased to 40% equity / 60% fixed income from 33% equity / 66% fixed income. Mid-year rebalancing took place at the end of June to reflect updated long-run forecasts.